tonight i’m craving sweets, and even though i can cook a thing or two, when it comes to baking i’m pretty hopeless. having said that, a few years ago my good friend Claire (an incredible cook-her desserts are legendary) shared a simple crumble recipe with me which has been used for years by her family in France. i’ve used it in many variations to make one of my favorite desserts: the peach & berry crumble (i guess you could call it a cobbler). Claire adds rolled oats-i didn’t this time-see photos. variations: you can add cinnamon &/or ginger (to taste), chopped almonds, chopped walnuts, rolled oats, or any seeds (pumpkin is good) of your choice. put all ingredients in a cuisinart (or similar) food processor and pulse carefully several times. you want to refrain from over mixing- just a few short, quick pulses. you could also do this by hand if you’d like. 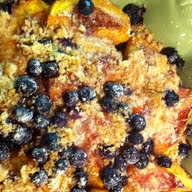 cut and slice good organic ripe peach (or nectarines), and put in a shallow baking dish with organic blueberries, top with crumble topping, (above i added a few extra dots of butter as i found it slightly dry. bake in a preheatd oven (uncovered) at 350-375 degree for about 40 minutes ( keep an eye on it). you can serve this (warm) with vanilla ice cream or whipped creme fraiche sweetened with a touch of raw honey. 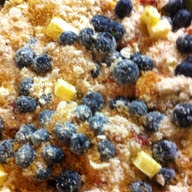 Posted in berry crumble, blueberry peach crumble, crumble, easy dessert, fruity dessert, peach desserts by cooking minette.